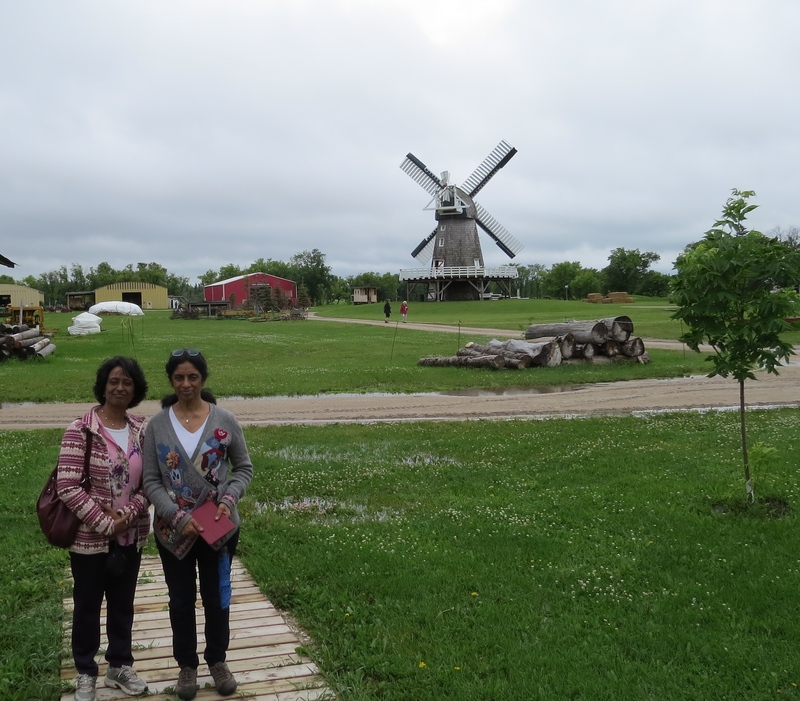 Introducing Visitors from India and Hong Kong to Mennonites | What Next? 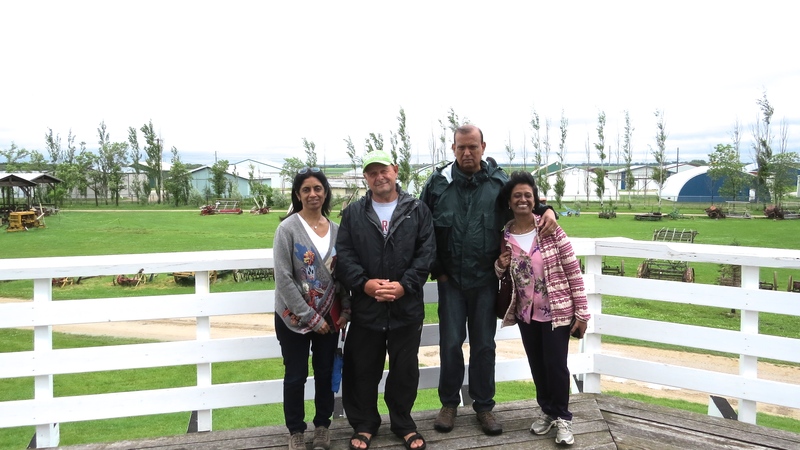 Our friends Meena and Anil from Hong Kong and Meena’s sister Beena from Delhi, India are visiting us here in Manitoba. 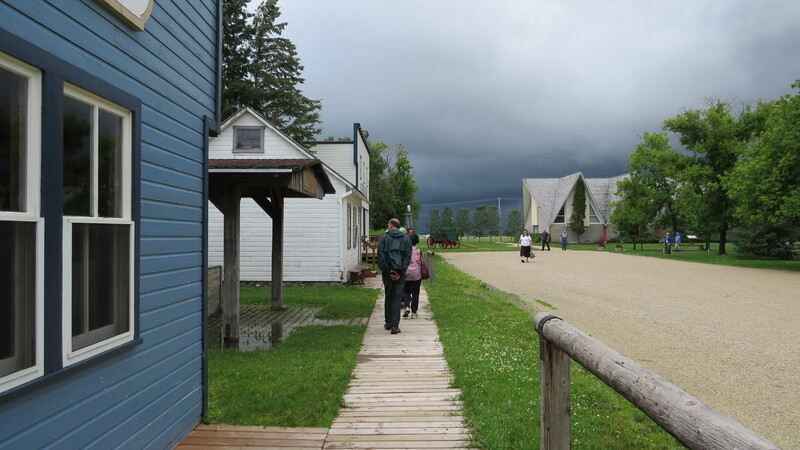 Today Dave and I took them to the Mennonite Heritage Village Museum in Steinbach to introduce them to Mennonite culture and history. 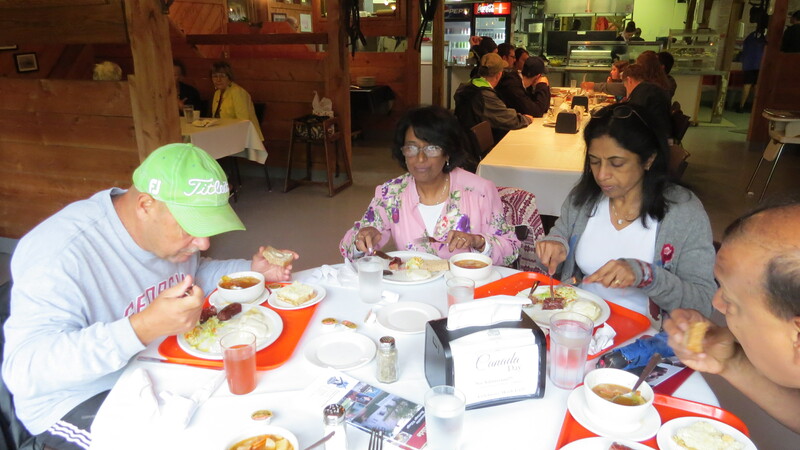 We arrived around 12:30 so the first order of business was lunch in the Livery Barn Restaurant. 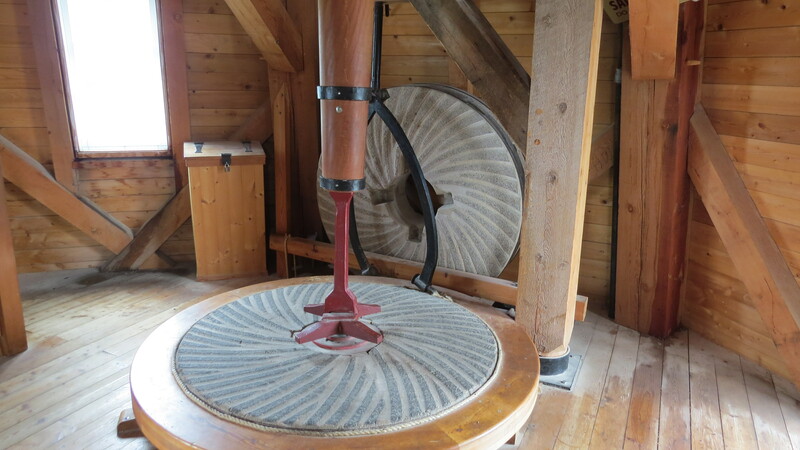 After we had explained what Mennonite foods like kielke and roll kuchen were- our guests chose a traditional meal of verenike with schmaunfatt, kommst borscht, platz, farmer’s sausage and brown bread made from flour ground in the museum’s windmill. 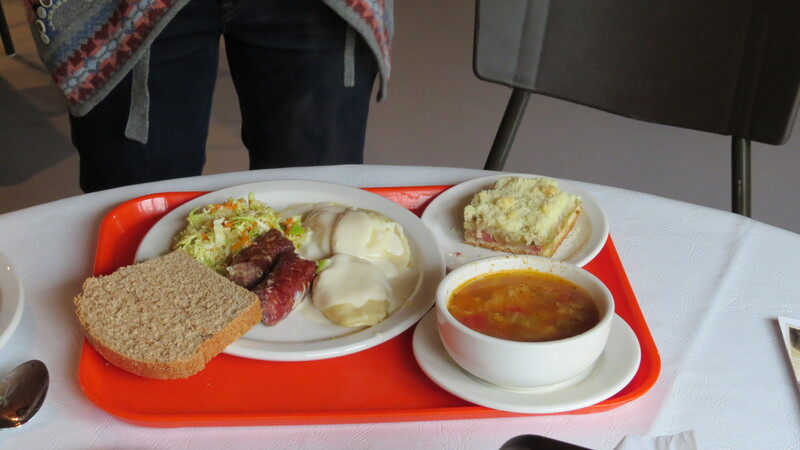 They declared the Mennonite food delicious and fortified by our hot meal we were ready to brave the cold rainy weather for a tour of the typical Mennonite village laid out on the museum grounds. 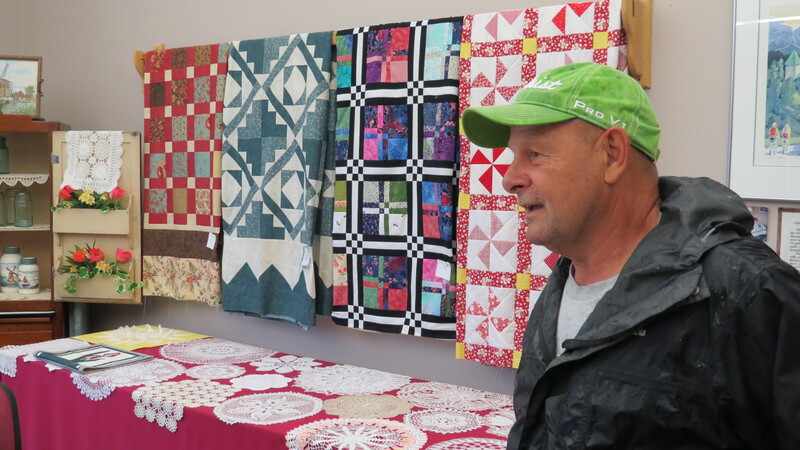 Dave described how barns were attached to houses in Manitoba Mennonite villages to make it easier to feed and care for the animals in winter without having to go outside in blizzard conditions. The heat from the animals’ bodies also helped to warm the house. 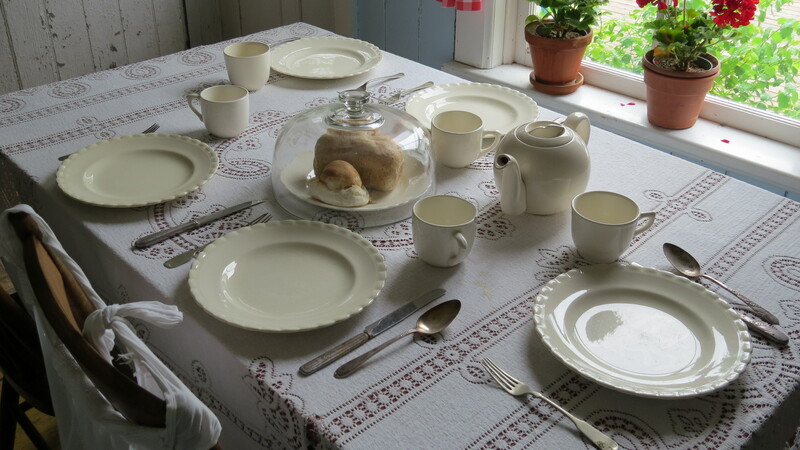 We had been trying to explain to our guests what zweibach were and luckily there were some of the two-tiered buns or rolls on the table in the house barn to show them. 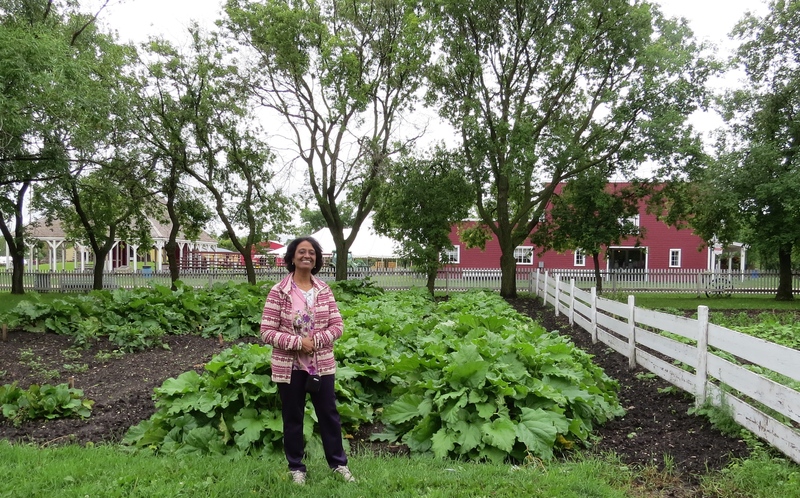 In the house garden Beena wanted to see the rhubarb. At lunch she had enjoyed her rhubarb platz and wondered what kind of plant the fruit came from. There are no rhubarb plants in India. 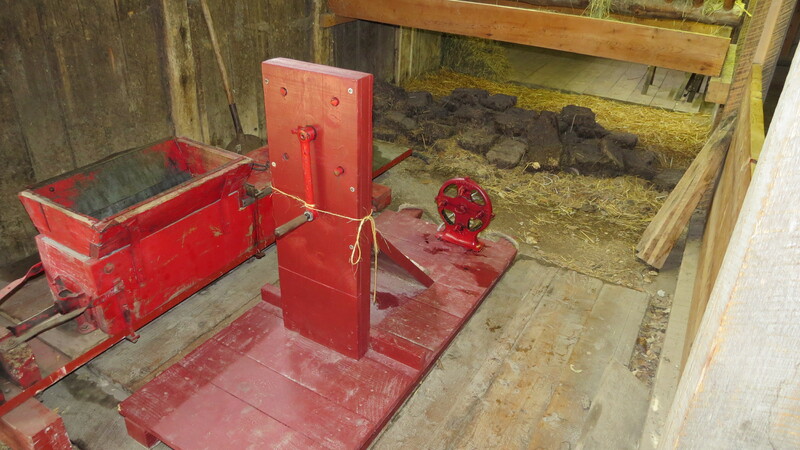 I wanted to show them this manure brick making machine.Demonstrating its use to visitors was my Dad’s job for many years when he was a volunteer at the museum. The early Mennonite settlers used the manure bricks for heating. 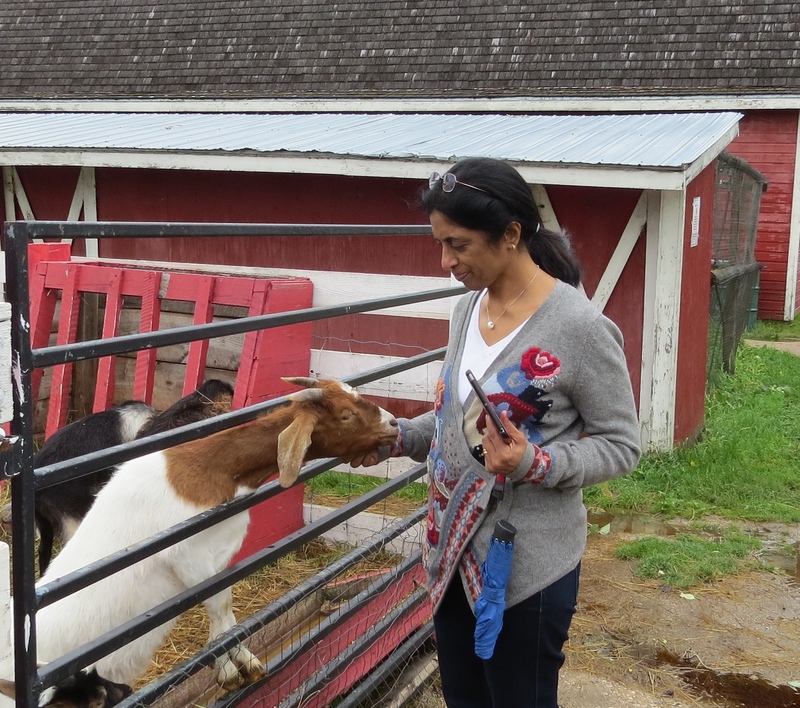 Meena made friends with some of the farm animals housed on the museum grounds. 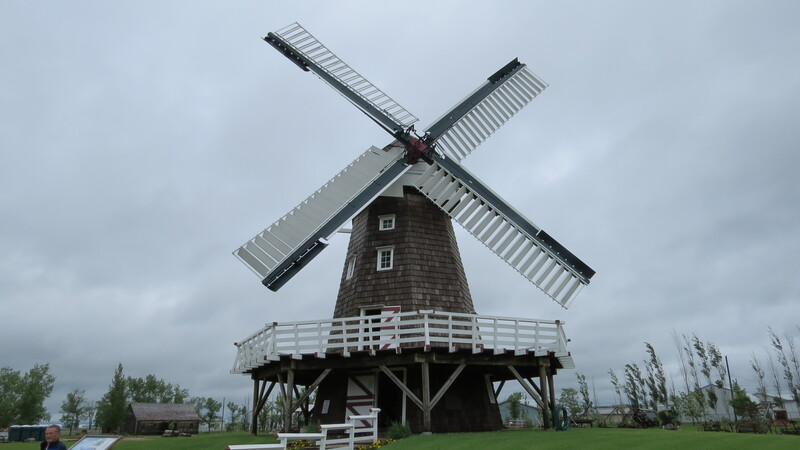 We toured the museum’s signature windmill to learn how wheat is ground into flour when the wind propels the sails and causes the huge grinding stones inside to move. We posed for photos on the windmill’s windy balcony. 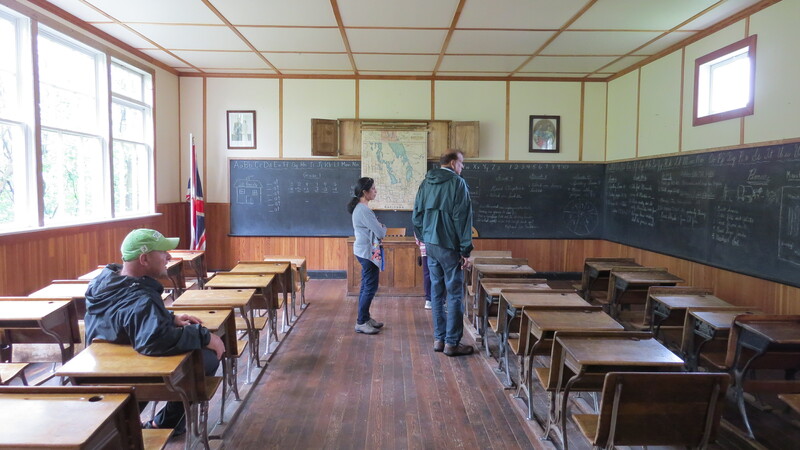 We visited the one room school and looked at the assignments for all the various grades written on the chalkboard. 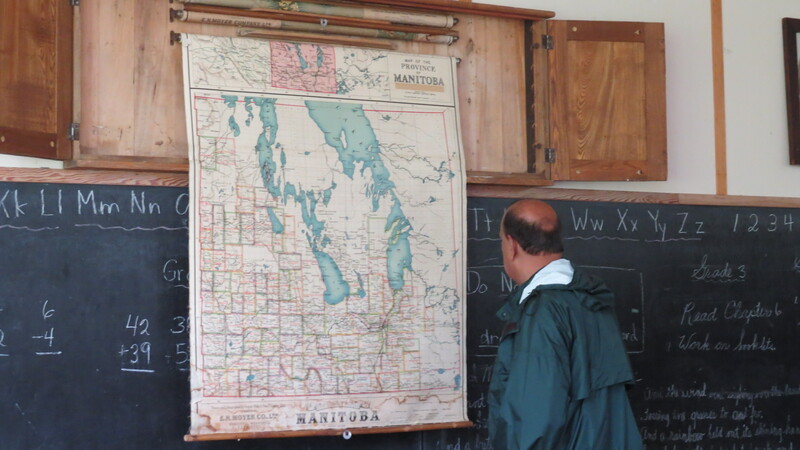 Anil studied the map of Manitoba and was interested to see how many lakes there are in our province. 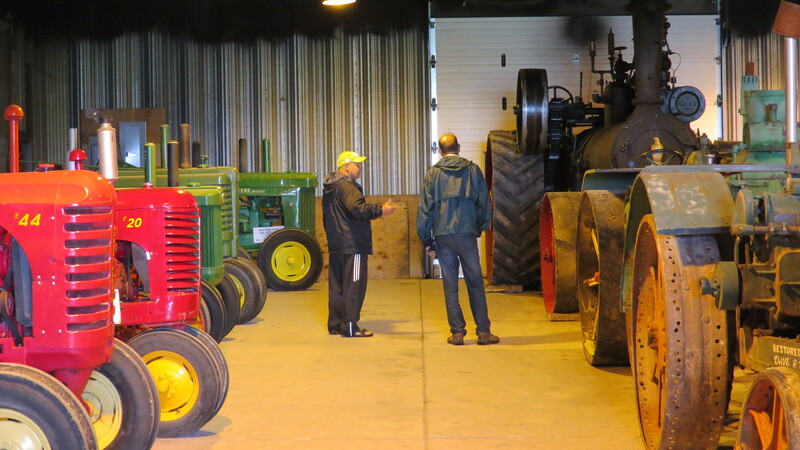 In the transportation shed Dave showed our visitors the kinds of tractors his family had owned and used when he was a boy working on their farm in southern Ontario. 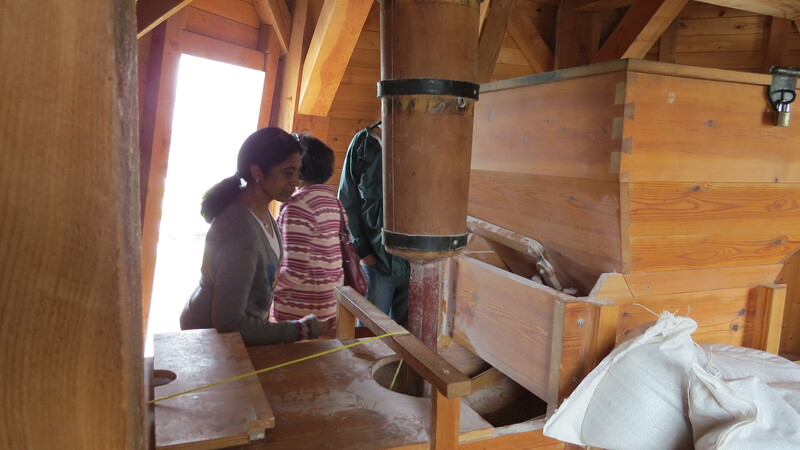 Here he explains to Anil how the steam engine ran the threshing machine. 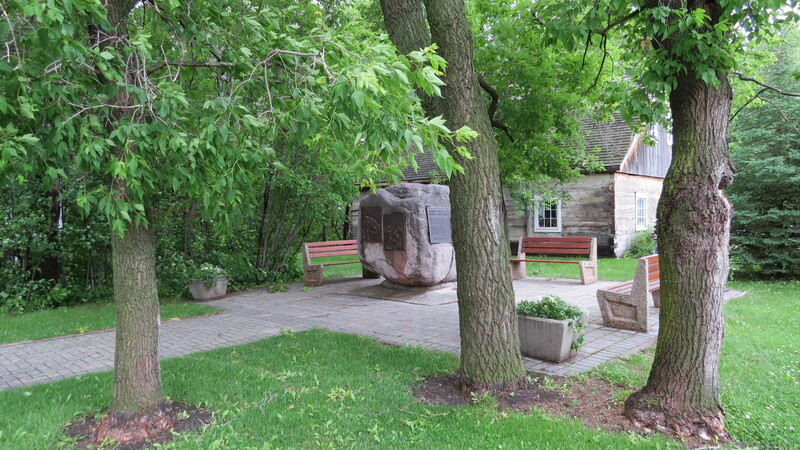 We looked at the special monument built to pay tribute to the work of pioneer women. 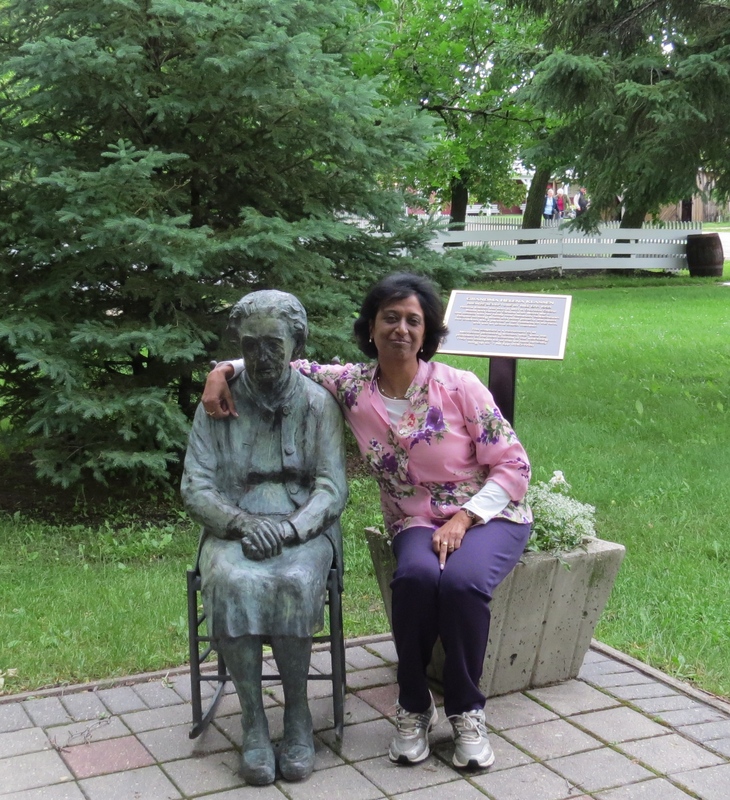 Beena posed with the sculpture of a Mennonite woman by Saskatoon artist Bill Epp. 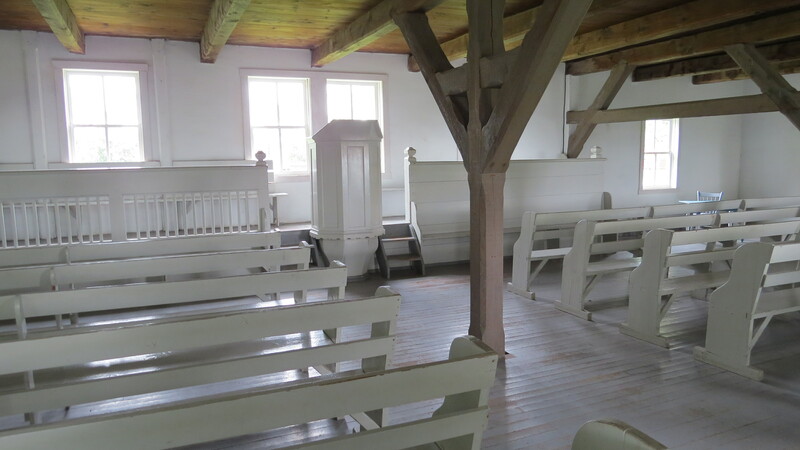 We visited the church and explained how men and women had sat on opposite sides and singing had been led by a vorsinger who stood near the pulpit. 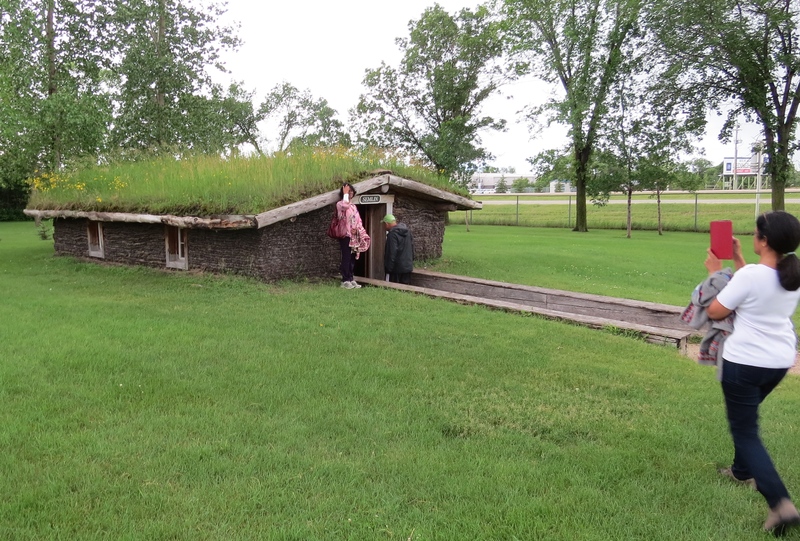 Before the rain began to pour we managed to sneak in a visit to the underground house made of earthen sod called a semlin which the first Mennonite immigrants lived in till they could build other homes. 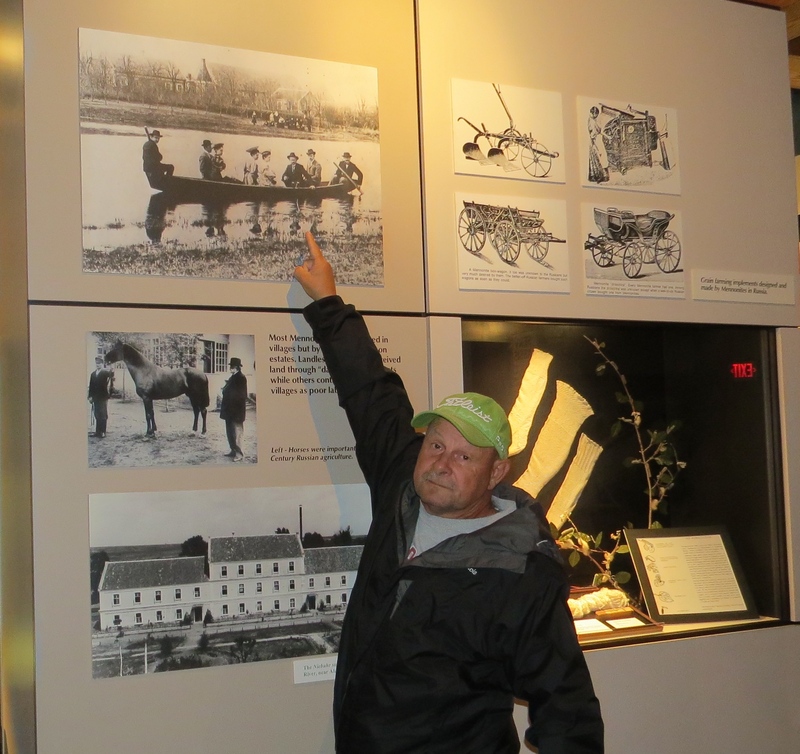 In the main building we learned about the history of the Mennonites in the galleries and Dave made sure to point out the photo of his grandfather in a boat on the lake in front of the Enns family estate in Ukraine. 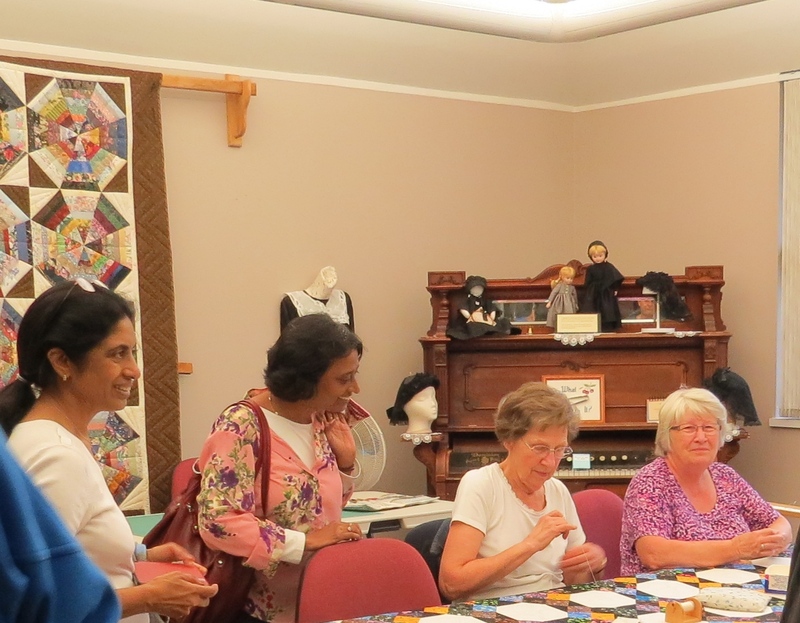 Our guests who all are originally from India, were surprised to learn that there are over a 100,000 Mennonites in India. 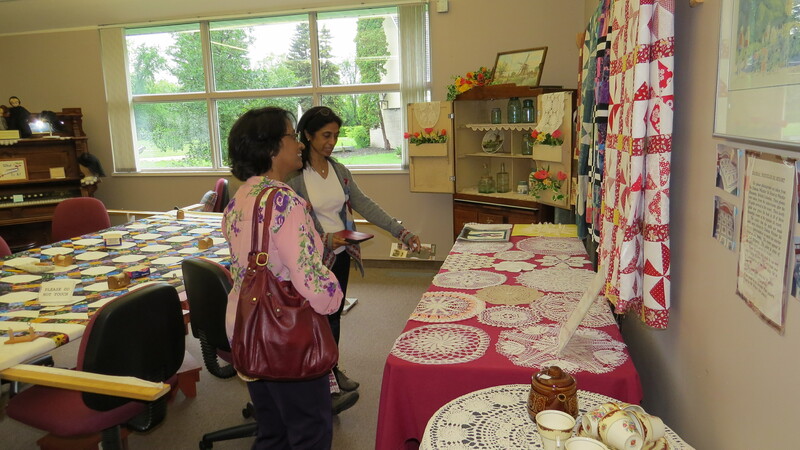 Meena and Beena were especially interested in the women who were quilting and spent a long time looking at the crochet and quilting work displayed. 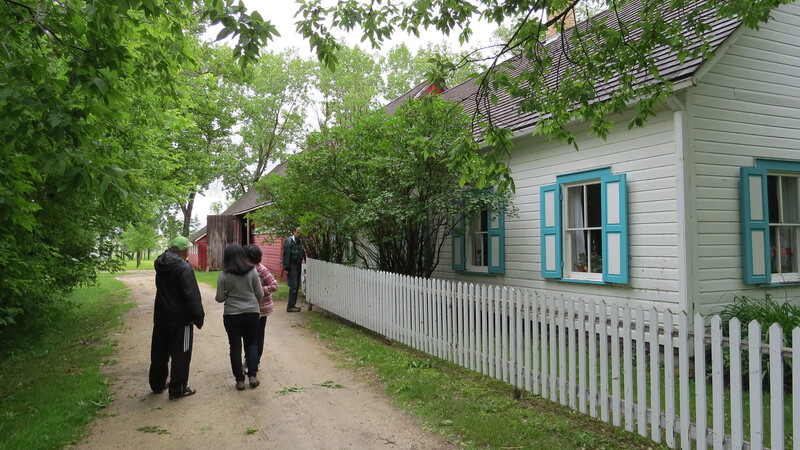 Dave was eager to leave since he wanted to give our visitors a tour of Steinbach where we had lived for over thirty years before we headed back to Winnipeg where he made a pizza with Mennonite sausage for our supper. 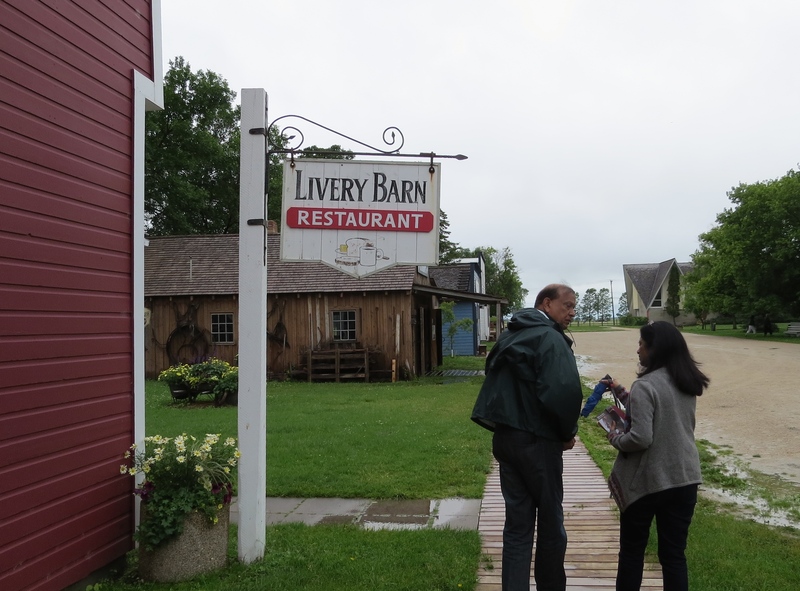 Dave and I had not been to the Mennonite Heritage Village Museum since our move back to Manitoba from Hong Kong and taking our Asian visitors on a tour was a great way to reintroduce ourselves to the museum and see all the changes that have taken place there in the last decade.